"We're scavenging a derelict protoss ship." Space is made out to be this vast, undiscovered frontier with an abundance of planets to discover and alien lifeforms to encounter. It's also a rough and tumble place where bad alien lifeforms take up residence. 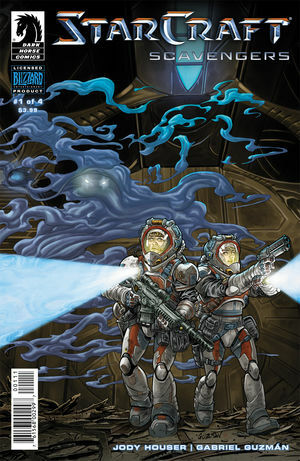 Starcraft: Scavengers #1 from Dark Horse Comics looks to be a little of both sides. The issue is written by Jody Houser, illustrated by Gabriel Guzman, colored by Michael Atiyeh and lettered by Steve Dutro. A group of terran space scavengers hope to pull off the job of their lifetimes, pillaging a derelict protoss ship. Houser does a very solid job of giving all the characters in the book their own sense of purpose and backstory, weaving them together in a way that's entertaining and strong. The dialogue exchanges between the characters is very natural, allowing Houser to fill the reader in without force-feeding them. That being said, the story itself feels a little formulaic in that Houser ensures all the right things are presented for a space horror story. The plucky new kid, the hard-nosed commander and the reckless solider all play parts in the first issue that feels pretty ambitious, both as a first issue and the precursor to a larger series. Houser ends the issue with a somewhat predictable cliffhanger of sorts that pits the scavengers against an unknown entity designed to ramp up the suspense for future issues. Guzman does a wonderful job with the artwork by making it feel like a proper space horror book without cribbing too much visually from something like Alien. The characters are in costumes and outfits that straddle the line between old-school military and futuristic space explorers, all the while giving the book a decidedly foreign feel. Guzman lays the panels out as if they're adrift in space, relying on the empty gutters behind them to help focus the reader's attention on the action. In fact, the majority of the artwork focuses on the people rather than the vehicles and settings, something that seems to be at odds with Starcraft as a game, but something that Guzman makes work. Atiyeh provides the book with colors that are dark and ominous throughout, matching the tone of the issue well. Starcraft: Scavengers #1 is a pretty straightforward tale about space scavenging gone wrong, something that just about all tales about space scavenging end up being. The scavengers looking for a big payday are in for an even bigger surprise. Houser's narrative is evenly paced and hits the right notes for a first issue. Guzman's illustrations give the book the appropriate lost in space feel befitting a story about scavengers. Starcraft: Scavengers #1 should have embedded appeal for fans of Starcraft, but readers looking for a new tale of space woe may also want to check things out. Starcraft: Scavengers #1 is available now.